Premiering next Monday is the brand new GSN comedy show, Drew Carey’s Improv-a-Ganza. Featured on this new comedy show are some of the former stars from ABC’s Whose Line is it Anyway, including Colin Mochire, Ryan Stiles, and Let’s Make A Deal host Wayne Brady. (Quick side note: Prepare yourself for the worst segue ever.) With this in mind, in this week’s article I’m going to do a review on CBS’s Let’s Make a Deal hosted by Wayne Brady and a countdown the top five funniest running jokes on Whose Line is it Anyway. Enjoy! 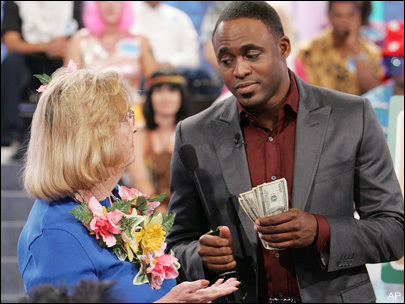 Premise- Host Wayne Brady would go through the audience and select “traders” to make deals with him for cash and prizes. However, the traders have to be careful about the decisions they make in their deals because at any given moment, a trader might trade away everything they have won up to that point for a “zonk”, or a booby prize. On average, about six deals are played per show, excluding the Big Deal of the Day. After all the deals have been made, Brady would select one of traders from the day (starting with the player who won the most in cash and prizes) and asks them to give up everything they have won to play in last game of the show, “The Big Deal of the Day”. In the Big Deal, there are no zonks, no guarantees that they will win The Big Deal, and the contestant has the option of choosing Door #1, Door #2, or Door #3. Behind one of the doors is a lesser value prize, another door usually contains the Let’s Make a Deal Vault, and another door contains The Big Deal, usually worth around $25,000. The show pretty much kept true to the classic format (including the “quickie deals” at the end of the show), with the exceptions of the hour-long format and only one trader plays in the Big Deal of The Day. I will admit I wasn’t too thrilled with only one trader playing in the Big Deal at first because I was so accustomed to seeing two traders playing in the Big Deal. Now, my only guess to why they have one trader to play in the Big Deal is to save money, as (once again) each Big Deal is worth around $25,000. True Let’s Make a Deal fans would recognize some of the classic deal games played frequently such as “7 Envelopes”, “One Deal and You’re Done”, and “Stack of Bills” (“Stack of Checks” in CBS version), and there are even some new deal games in the show that are fun to watch and fun to play. One aspect of the show that caught my eye was the inclusion of “The Big Deal Surprise” in the second season. “The Big Deal Surprise” is not The Big Deal of the Day, but is played similarly to it with the trader choosing one of the three doors. Behind two doors are lesser value prizes and behind one door was the “Big Deal Surprise” prize worth about $15,000. The rare occurrence of The Big Deal Surprise reminds me of “Door #4” in The All New Let’s Make a Deal (shown in the video below). Also, the traders have a better chance of winning the big prize in The Big Deal Surprise rather than on the Door #4 game. The one thing that do miss on the show are the “sneak peek prizes” that are shown before the actual prize (or “zonk”) is shown behind a curtain or box. For example, a curtain could open to a large, over-sized box of Eskimo Pies that represented $500 worth of Eskimo Pies before the box was moved to reveal whatever was behind it. As for the starring trio of the show, host Wayne Brady, announcer Jonathan Mangum, and model Tiffany Coyne, the producer could not have chosen a better combination for this generation of Let’s Make A Deal. During the first few episodes of the first season, Wayne Brady started off slow in hosting the show, but quickly grew into his own and made the show his own by having fun with the contestants and including improv skits in some of his deals throughout the show, which usually included Mangum, Coyne, or both. The skits that are performed on the show by Brady and Mangum are always entertaining to watch. Those skits remind me of the humorous skits Geoff Edwards used to do on Treasure Hunt before he would reveal the prizes. Like Monty Hall and Jay Stewart, Brady and Mangum are a great duo for this show. Brady and Mangum remind me of two brothers in terms of how they often joke around with each other on the show and the humorous little “spats” they have with each other during the deals. Even though Monty Hall will always be “America’s #1 big dealer”, Wayne Brady is doing a wonderful job following in his footsteps. And to close this week’s article, in the immortal words of Monty Hall during the 1963 Let’s Make a Deal pilot episode: “Caveat Emptor: Let the buyer beware”. – Hall serves as a creative consultant for the current version of Let’s Make a Deal. 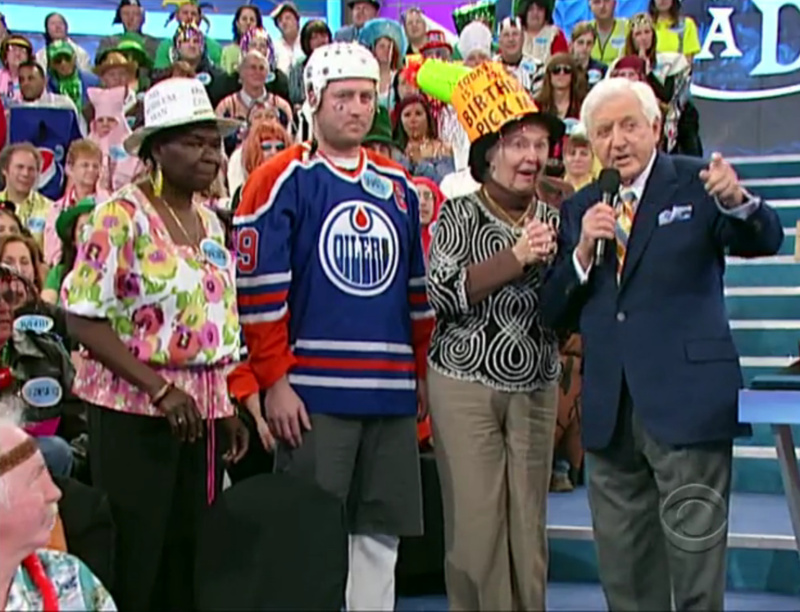 – Hall returned Let’s Make a Deal as a special guest host from March 22-26, 2010. In honor of the upcoming series premiere of Drew Carey’s Improv-a-Ganza, I am going to countdown the top five funniest Whose Line is it Anyway “running jokes”. For those of you who aren’t familiar with the show, a “running joke”, when it is concerning Whose Line, is a humorous one-liner or joke that is usually told during the first game of the show and receives a lot of laughs by the audience, host, performers, musicians, etc. That “running joke” is usually mentioned periodically in other games that are played on that show and still receives positive feedback from everyone there. With that being said, let the countdown commence! One of Colin’s random answers to a question asked by Ryan Stiles in a game called “Greatest Hits” becomes the running joke for the show. Wayne Brady’s rendition of YMCA goes horribly wrong. His mistake, in fact, throws off the show’s pianist, Laura Hall’s rhythm. An interesting game of “Sound Effects” with a somewhat repetitive theme. An idea given by a member from the audience is accepted for the game “Title Sequence”, where performers have act out an opening sequence to a sitcom featuring two unlikely roommates. This idea, however, didn’t sit well with the director (or possibly with the FCC). I hope you’ve enjoyed this week’s “double-header” article. Keep your eyes peeled for the series debut of Drew Carey’s Improv-a-Ganza on April 11 at 8:00pm EST on GSN. See you next week everyone! If you're a black female and need a car go on the Wayne brady show, 90% of the cars givin away are to women of color!